In this activity, you define posting keys. Users specify a posting key before entering a line item. 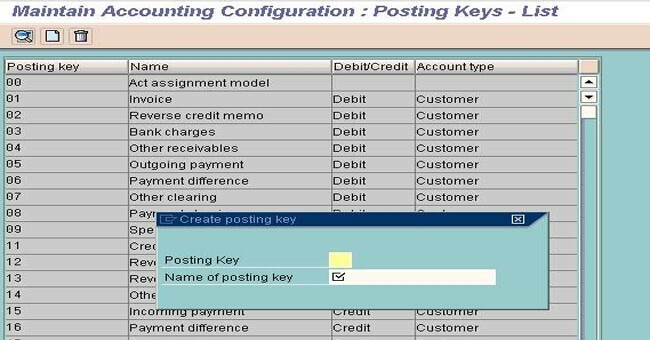 The posting key controls how the line item is entered and processed. which fields the system displays on the entry screens and whether an entry must be made (field status). Use the posting keys delivered with the standard system. 1. Check the standard settings. 2. Modify them if necessary. Complete the screen by filling the required data and press enter. Reverse key is the posting key to be used for reversing the data created by using the original posting key for that transaction. Are Posting Keys defined at the Client Level??? ?